Anytime I want to download a program from the Internet I think of RUSSIA, don’t you? No, I’m not talking about the former USSR. And no, I’m not sharing files with Putin. I’m talking about an easy to remember acronym that is simple to follow: R.U.S.S.I.A. The R in RUSSIA stands for Research. Before you download anything, you better research it. It is vital to know as much about what you are downloading, who the author is and the where on the web where you plan to download it. The U in RUSSIA stands for Uncheck. Have you ever seen those pre-checked “optional offers” when downloading a program? Even the major companies like Adobe and Oracle are doing it. You have to be on your guard and keep a watchful eye on making sure that you Uncheck what I like to call “Stowaways”. These “Stowaways” are usually useless toolbars or other garbage offers. Not only can they be resource hogs (meaning that they’ll make your system run slower), but they can also change your home page or your default search engine. These “optional” programs are not required to install the main program, so remember to Uncheck them. The first S in RUSSIA stands for Save. Depending on how your system is configured, you may have the option to Run or Save a downloaded program. We highly recommend that you Save it because you're not quite ready to install it. When you Save it, make a mental note as to where on your hard drive it is located. On a Windows system, browsers usually save files to your Downloads folder. The second S in RUSSIA stands for Scan. Now that we’ve saved the program to our hard drive, we should now Scan it with our anti-virus or anti-malware program. This extra step can make all the difference in the world, because no matter how much research we’ve already done, getting a second opinion from an industry reference is always a good idea. Scan the file or Scan the entire folder if you like. There’s no need to be in a hurry. 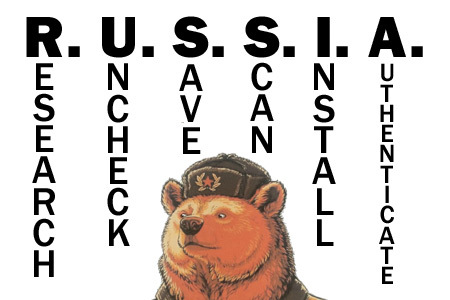 The I in RUSSIA stands for Install. We’ve come a long way to get here. But now we’re faced with the moment of truth. Is this program safe to Install? Nothing is guaranteed, but we’ve followed some fairly safe procedures in making sure it’s safe. Finally, the last letter in RUSSIA, the A, stands for Authenticate. By Authenticating, we will be verifying that no other “Stowaways” have been installed, no strange new toolbars have been attached to our browser and our home page is still intact. We can also check our Programs and Features list to make sure the new installed program is the only recently installed program. By Authenticating what we’ve done, we will also run scans again to verify that no malware has made it onto our system. And that is why you should think of RUSSIA each and every time you want to download anything from the Internet.